As everyone probably knows, the musical had been reworked and as a result, it went through some changes. Gone are the geek/Greek muses that narrated the musical, and in its place, a more traditional retelling of the Spider-Man origin, with a larger focus on the Peter/Mary Jane romance. The main villain, Archane, was also pushed further into the background giving more face time to Green Goblin and his Sinister Six. With these changes, does the Spider-Man musical finally work? For your friendly neighborhood comic fan, Turn Off The Dark is sort of a mixed bag. For every good thing about the play you can talk about, there is a bad aspect. For one thing, the entire production is really something to behold. From the dancers to aerial silk performers, the musical feels like it was bitten by a radioactive Circ du Soleil performer. When Spider-Man starts to swing around the theater, the production truly comes alive. It is a scene to behold. The sets are also elaborate and amazing. Whether it is the halls of Midtown High or a fight scene on top of the Chrysler Building, the dazzling set pieces really stand out, giving the musical a comic book-realistic sensibility. On the other hand, while the overall feel of the production is big and bold, there are times where it feels too over-the-top. From outrageous villains [Swiss Miss?!?!] to an actor fighting a large man-sized balloon (it will make sense once you see it), sometimes the musical goes off the rails. Also, while the musical is exciting overall, the second act lags, even with the action sequences between Spidey and the Goblin. When it does not lag, it is confusing. I know for a fact that Spider-Man beats Goblin in a battle, but if you ask me how, I wouldn’t be able to tell you. Despite all of this, the only truly disappointing spot for me was the omission of Peter’s role in Uncle Ben’s death. In the original story, Peter had a chance to apprehend the killer of Uncle Ben but didn’t lift a hand to help. In the musical, the robber enters Peter’s home while he was out winning money to buy a car. While this appears to be a slight alteration, it really does change everything. It is the guilt of knowing he could have stopped the killer that gives birth to Spider-Man. It is the essential part of the Spider-Man mythos and the production suffers without it. The cast is more or less decent in their roles. Reeve Carney’s portrayal of Peter Parker is decent enough and his singing voice is fair. If I had to imagine a musical version of Peter Parker, he would be it. He also had a lot of chemistry with Jennifer’s Darmiano’s Mary Jane. Darmiano’s singing voice was definitely the stronger of the two and her acting hit most of the right notes. The only oddity in the casting was Patrick Page, the actor who played Norman Osborn/Green Goblin. Page had a presence on the stage, though I don’t know if he struck the right chords with the audience. His portrayal of the Green Goblin felt more like an audition tape for the role of The Joker. Pitch perfect for the clown prince of darkness, but I am not sure if it was right for this role. The score, by U2’s Bono and The Edge, is exactly what a rock musical needs. It is loud, dynamic, with the right balance of catchiness and repetition. The only problem is that a majority of the songs sound like U2 singles. This is great in theory, but only if the singers sound like Bono. This is made more evident by the solo numbers sung by Carney, a decent singer, but definitely not Bono. Along with changes in the musical, a new number, “Freak like Me,” was also added. Channeling more Lady Gaga than U2, it is the weakest number in the whole production and felt oddly out of place with the rest of the score. Despite the problems with some songs, when a number works, it literally soars. The solo “Rise Above” is great and I found myself humming it after the show. The duets between Peter and MJ also shine. 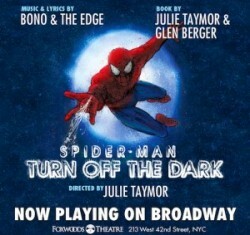 In the end, Spider-Man: Turn Off The Dark is not a great musical by any means. The musical is at times confusing and the second act does not deliver. But try to tell that to the packed house at the Foxwoods Theatre, who gave the group a standing ovation. It is a crowd-pleaser and despite all the flaws, pretty damn entertaining. If you plan on swinging over to Broadway to see Spider-Man: Turn Off The Dark, please don’t expect it to be the Spider-Man you know and love. If you drop that expectation, I think you will be pleasantly surprised.